urses typically must wear scrubs to work, but beyond that there are so many ways to personalize your look. 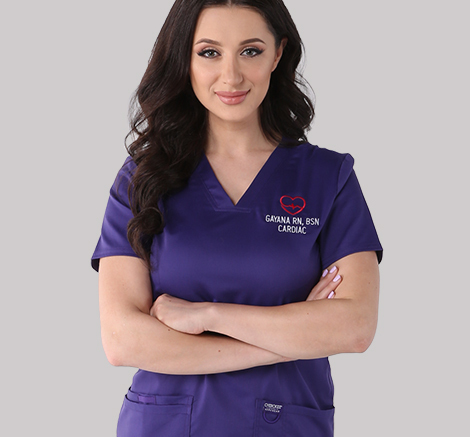 Not only can you choose from scrubs in dozens of solid colors, there are hundreds of printed scrubs available as well. But personalizing your medical uniform doesn’t stop with your scrubs. Read on to discover eight ways you can customize your look that are both hospital- and nurse-approved. Stethoscope charms are small decorative elements that snap around the tubing of a stethoscope, almost like a cuff bracelet. Add just one for an understated look, or string a few together to match a whole color scheme or theme. Many hospitals or units don’t allow actual jewelry for safety reasons, since patients can grab them, so think of these charms as jewelry for your stethoscope. Speaking of stethoscopes, don’t forget that you can take yours beyond the classic black and silver. The tubing comes in dozens of colors, and the metal head offers several finishes, such as gold or black. 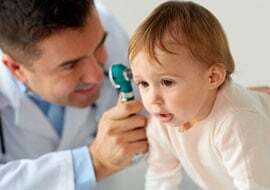 If you’re worried about getting your stethoscope mixed up with someone else’s, you can get your name, initials or even a special message engraved on it as well. The stethoscope engraving process won’t delay shipping, and you can add the inscription to the head, as well as the tubing on certain models. No one else may see your socks but you, but that doesn’t mean they have to be boring. Compression socks are one of the most critical parts of any nurse’s uniform since they improve circulation and help prevent blood clotting—and they do it all in a range of fun designs, including stripes, dots, florals and even leopard print. Of course, nursing shoes come in your standard neutral colors—brown, black, grey—just like any type of business shoe. 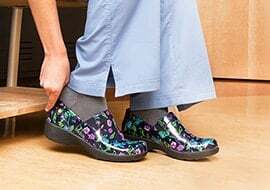 However, if you don’t want to go the traditional route, nursing clogs also come in a variety of bright patterns and colors. From fire engine red to a swirling rainbow mosaic to a bold floral pattern, these shoes are anything but ho-hum. If you want a different silhouette from the clog, you can try a sneaker or slip-on instead. Not only will your shoes’ design stand out from the crowd, they will also keep you comfortable as you stand for hours a day. You’ve got to wear your badge, so you might as well display it in style. Choose from a lanyard or a reel, as well as many different designs and patterns. You can even use your badge holder to represent your alma mater or dedicated cause (such as autism or breast cancer awareness) as you customize your uniform. Watches may seem antiquated, but as a nurse, you won’t always have a cell phone on you (some hospitals or units don’t allow cell phone use during shifts). There might not always be a wall clock nearby, so wearing a water-resistant watch ensures that you always know what time it is while adding a bit of color to your look. If your hospital or unit allows it, you can purchase pins or jewelry to wear on your lanyard or lab coat. Professional nursing pins can indicate your specialty or certification, while others advocate for a cause of your choice. Engravable name tags are also available if you need a form of identification. Your dress code as a nurse can seem restricted: You have to wear scrubs and you’re often prohibited from wearing jewelry, fingernail polish and other accessories that people in a regular work setting can wear. 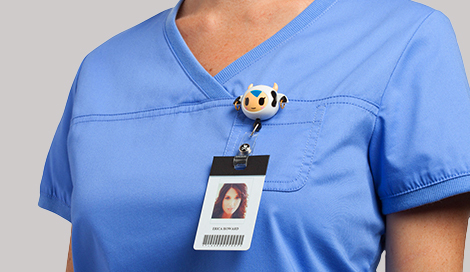 However, within that framework there are many different personalization options you can explore–from the color of your scrubs to stethoscopes and charms to playful badge holders to customized engraving and embroidery. Whether it’s a small touch or a whole ensemble, you can start personalizing your medical uniform today.